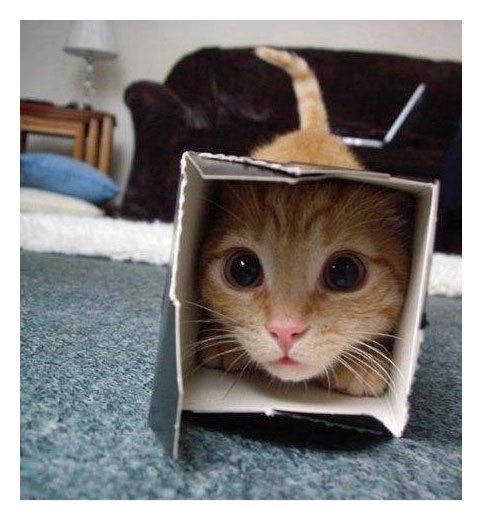 OneHumor | Kitty In A Box - OneHumor is a collective of cool content featuring funny videos, funny movies, classic TV ads, virals& silly pictures. This note is a cry for help from a maiden in distress about the power of the dorm shower head. Problem is how the hell does she know what she knows, it begs the question - WTF!?! Hanging out with the cool kids. It's something that everyone wishes they could do but statistically very few will ever achieve. You'll probably end up hanging out with a bunch of flid-handed weirdos. If you're a fan of internetisms then this is the shirt for you. It features all the usual suspects on the front, a Reservoir Dogs theme and even a surprise waiting for you on the back. Awesome. Do you think the time that the president decided to announce they'd killed Osama was intentional? Not because of the proximity to the mission but because he could get one over on Donald Trump. There's something strange... in your neighborhood. Who ya gonna call? Probably not as funny as Bill Murray, but definitely serves a more realistic purpose. Have You Met My Friend? You know the scenario, you are at a party, doing the social thing when all of a sudden someone comes over to you to say 'Hai', does some social pleasantries and then introduces you to their 'friend' - OMG! Ever wondered what Wolverine or the Hulk might look like if Picasso had taken an interest in comic books? It's a perfectly valid thing to contemplate, and this artist has done more than that, he's gone and drawn them. A Man Recreates Himself in Sims - WTF!?! Bored of real life, nothing going your way? Why not do what this guy did and create a Sim of yourself and live out your weird fantasies in a virtual world. Then go see a psychiatrist you goddamn freak.